Tickets on sale now at chefsgalasf.org. 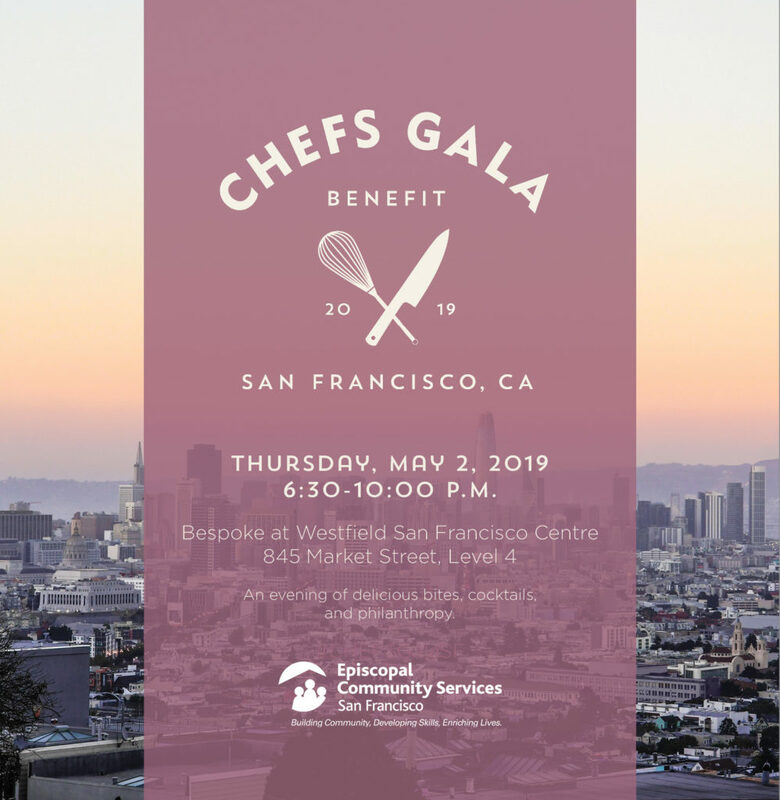 San Francisco, CA, April 8th, 2019 – Beth Stokes, Executive Director, and the Board of Episcopal Community Services (ECS) of San Francisco, a leader in San Francisco’s plan to create more supportive housing for individuals and families experiencing homelessness, are proud to announce the organization’s 15th annual CHEFS Gala fundraiser on May 2, 2019 from 6:30 p.m. – 10:00 p.m. at Bespoke, located at 845 Market Street atop Westfield Centre. We are honored to welcome international television icon, Master Chef, food consultant and prolific cookbook author, Chef Martin as our celebrity emcee. Chef Yan is the recipient of numerous awards and honors from The James Beard Foundation Awards, The Antonin Careme Medal, The American Culinary Federation, and the American Academy of Chefs. We are also pleased to announce Emmy Award-winning radio and TV personality Liam Mayclem as our auctioneer for the evening. Mayclem is best known as the host of Eye on the Bay on CBS 5 and “The Foodie Chap,” celebrating San Francisco Bay Area culinary stars daily on KCBS Radio. CHEFS Gala seeks to raise awareness of ECS’s vital programs, including the marquee CHEFS program. This 10-12 week culinary training program provides people impacted by homelessness and poverty with technical and professional skills through classroom instruction, hands-on kitchen training, and a local food service internship. Guests at the event will enjoy tastings and cocktails from a variety of the City’s finest restaurants and from ECS’s own CHEFS program while participating in live and silent auctions. The fundraiser aims to raise awareness about San Franciscans experiencing homelessness and provide funds for housing, services, and job training for the 7,200 people who access ECS’s services annually. The 15th Annual CHEFS Gala looks to build on its momentum from previous years by creating even more opportunities for the very low-income men, women, and children that ECS serves annually. Many generous Bay Area restaurants, wineries, and breweries are rallying behind ECS and its mission to help homeless San Franciscans. Guests will enjoy bites from top San Francisco restaurants including Sorrel, Octavia, Nopa, Louie’s Gen-Gen Room at Liholiho Yacht Club, Smitten Ice Cream, Boulevard, Delfina, Rooh, and more. Guests will enjoy cocktails provided by Tonic Beverage Catering, as well as libations from Maven, Petrichor Wines, Bonny Doon Vineyard, and Pond Farm Brewing. Tickets are now on sale and can be purchased at chefsgalasf.org. For more than 35 years, ECS has pushed boundaries through innovative programs such being chosen by the city of San Francisco, in conjunction with Mercy Housing, to build and operate San Francisco’s largest permanent supportive housing development for formerly homeless people near Mission and 7th Streets. The two-building development will provide permanent homes for up to 265 households experiencing chronic homelessness, with 100 new units allocated to formerly homeless seniors, age 62 or older. With prime Mission Street frontage and over 5,000 square feet of ground floor commercial space, the new 7th & Mission development will also be the spectacular new site of ECS’s CHEFS workforce development program and an affiliated foodservice social enterprise. Since it’s founding, over 1,000 formerly homeless and very low-income students have participated in the CHEFS program. Lead CHEFS Gala sponsors include staunch ECS supporters Bi-Rite Family of Businesses, Cahill Contractors LLC, Caritas Property Management, Heffernan Insurance Brokers, Herman Coliver Locus Architecture, MUFG Union Bank Foundation, Hood & Strong, Keller & Benvenutti LLP, San Francisco Federal Credit Union, Silicon Valley Bank, Sutter Health CPMC, Xantrion and Zendesk. Episcopal Community Services of San Francisco (ECS) has provided essential services to homeless and very low-income San Franciscans since 1982, utilizing a holistic approach that addresses the multiple causes leading to homelessness. The agency serves more than 7,000 people a year – through emergency shelters, Navigation Centers, 12 permanent supportive housing sites, adult education, workforce development, and a senior day center — guided by a mission to help homeless and very low-income people obtain the housing, shelter, and services each person needs to prevent and end homelessness. For more information about ECS, visit www.ecs-sf.org. Tickets: Click here to purchase.